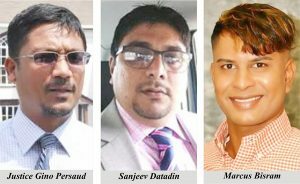 A visibly angry Justice Gino Persaud has issued an order to have Attorney-at-Law Sanjeev Datadin appear before him today in relation to proceedings related to the highly controversial Marcus Bisram murder case. Bisram is charged with the 2016 murder of Berbice carpenter, Faiyaz Narinedatt, who was found dead on the roadway at Number 70 Village, Corentyne, Berbice. In September, Datadin filed an application on behalf of Bisram to have the murder charge quashed. However, last Friday, after arguments were presented on behalf of both sides involved in the case, Datadin decided that he wanted to withdraw the initial application to quash the murder charge. The lawyer indicated to the Court of his intentions and even sent a notice of withdrawal to the Director of Public Prosecutions (DPP), one of the respondents in the case. The other respondents, the Chief Magistrate and Commissioner of Police, were not served with notices of withdrawal. Datadin was however informed by the court that the application to withdraw might not be possible at this juncture of the proceedings, owing to technicalities of the new Civil Procedure Rules, (CPR). 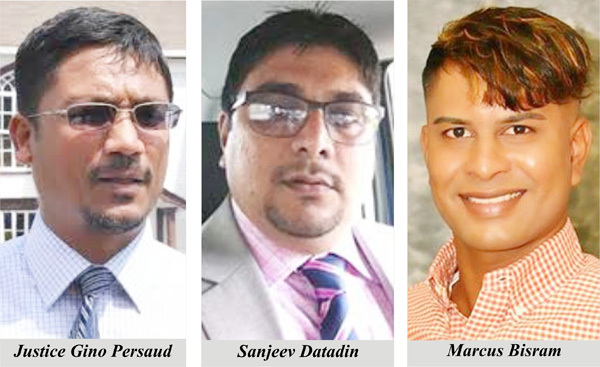 Yesterday, Justice Gino Persaud said that he had asked Datadin to produce legal citations in support of his move to have the application withdrawn at this juncture. The judge had already planned to make a ruling in the case. However, in his address to the court yesterday, he said that Datadin produced no grounds for his reason to withdraw the application at this stage. Datadin was not present for the hearing but standing in for him were Attorneys-at-Law Ganesh Hira and Siand Dhurjon. Dhurjon explained that the decision to have the application withdrawn is in the best interest of their client. But State Solicitor Kim Kyte, who is representing the DPP, the Chief Magistrate and the Commissioner of Police, urged the judge to hand down his decision in the matter. Kyte argued that the move by Datadin to have the application withdrawn constitutes a waste of judicial time and an abuse of process. The State Solicitor asked that a substantial cost be paid to the respondents. The judge, on the other hand, noted that he took decisions to deal with the matter in an expeditious manner, based on Datadin’s application. He explained that he gave the matter precedence over some 100 cases — some dating back to 2008. Justice Persaud further said that he will not allow the process of the court to be abused— which is exactly what was happening in this case. Justice Persaud held up a thick file which he says he spent hours perusing in order to come to a conclusion in the matter. Datadin had applied for an order Nisi to quash the murder charge laid against Bisram on the grounds that the charge is irrational, unreasonable, unfair, an abuse of power, unlawful, unconstitutional, without legal foundation, and null and void. Narinedatt was beaten after he allegedly rebuffed Bisram’s sexual advances early November, last year. The carpenter was allegedly dumped in the trunk of a car belonging to an acquaintance of the businessman, driven to a public road in Berbice and the scene made to look like a hit-and-run accident had taken place. The businessman was arrested at a New York beach front property, in Far Rockaway, Queens, in early July after a US Judge had issued a warrant for him. Prior to that, Bisram was posted on the Interpol wanted list. New York Judge, Peggy Kuo, filed the Certificate of Extraditability and Order of Commitment, paving the way for him to be sent back.